Mark Johnston is a professional writer and a passionate Motif user. 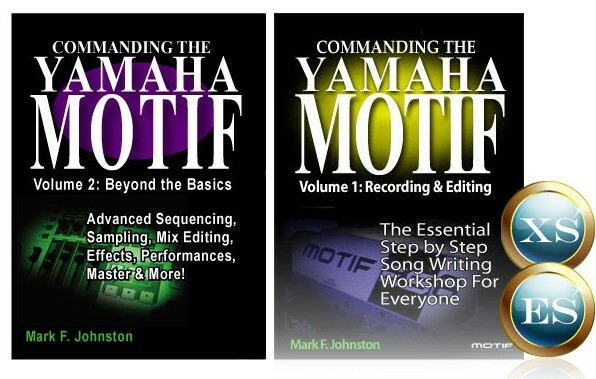 His first book, Commanding The Yamaha Motif Vol 1: Recording & Editing, is a no-nonsense romp through this aspect of Motif; guaranteed to get the nervous novice up to speed in record time yet still ‘thorough' enough for the informed Motif sequencer user to pick up plenty of tips and tricks. Mark works on a Motif ES and although the book is written primarily from this perspective, the original Motif (which Mark used to own) is fully included, with special sidebars where a button prod or screen may differ. The eBook has now also been updated to include Motif XS. Mercifully free from jargon (Yamaha's or anyone else's), this book simply tells it like it is. Mark does not try to cover every twist and turn of the sequencer engine, preferring to get you familiar and comfortable with the main processes and techniques and leave the ‘every option' explanations for another day. And actually that day may be coming not too far hence since Mark Johnston is already planning no less than four other Motif book projects! Presented as a series of short ‘classes' in which all of the main sequencer features are covered, Commanding The Yamaha Motif Vol 1: Recording & Editing contains excellent graphics, and works brilliantly as both an e-book (i.e. you can read it on your desktop) or of course in hard copy (you can print out the PDF if you fancy reading this type of tome in bed or on the couch). Available exclusively through Motifator.com and currently in download-only format, we welcome Mark Johnston to the Motifator.com family of experts. An impressive debut. Go Mark! As a follow up to Mark Johnston's Commanding the Motif eBook Vol. 1, Volume 2 goes beyond the basics into greater detail with sequencing, sampling, mix editing, effects, and more. The illustrations generally feature the Motif ES and XS, however, the vast majority of the instruction is applicable to Motif 'classic', and the MO series as well. Readers should know how to use Motif's Sequencer in both Song and Pattern modes. Please contact info@keyfax.com for any downloadable eBook support issues or questions.